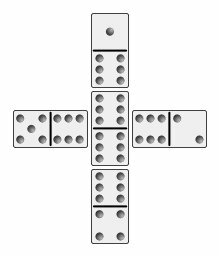 The player holding the double-six places the first domino. Play proceeds to the left (clockwise). Each player adds a domino to an open end of the layout, if he can. The four edges of the double-six must be filled before any other tiles may be layed down. This initial five-tile formation is called a "star". After creation of the star, play proceeds in the standard way, with dominoes added to the open ends. The difference is that in Sebastopol, there are four open ends rather than two. For example, in the illustration to the right, four tiles have already been played onto the four edges of the double-six. The four open ends are the 1, 2, 4, & 5. As is customary, the layout may flow in any direction, turning as necessary, and doubles may be placed crosswise or inline, as you prefer. A player that cannot make a move must pass. Since all tiles are in play, the game can never be blocked. The player that dominoes (plays his last tile) first wins the hand. The winning player receives the sum total of all the dominoes in his opponents hands. Optionally, if there are two players with a score of zero (one player that has dominoed, and one player holding only a double-blank), both players are declared the winner, and both players receive all the points in their opponents hands. Sebastopol is generally played to a score of 100, though any the "winning score" is arbitrary, and some groups play to 50, 150, 200, etc. depending on how long they want a game to last. There are a number of varieties of this game, and among them may be mentioned the following, which is not confined to four. If two, or three are playing, seven bones are drawn, if four 5, and if six or seven 3. The game must be begun with a double; if first player does not hold one he draws, and if he does not then obtain a double the down passes to the player on his left, and so on round the table till a double can be played. The players in turn from the leader now play one of the downed suit against each of the four sides of the double until the "star" has been made, and play then proceeds as in the Block Game, each in turn playing against one of the four radii with a domino of the same suit, until one of the party is "out." Pagat.com also mentions a three-handed version of the game.